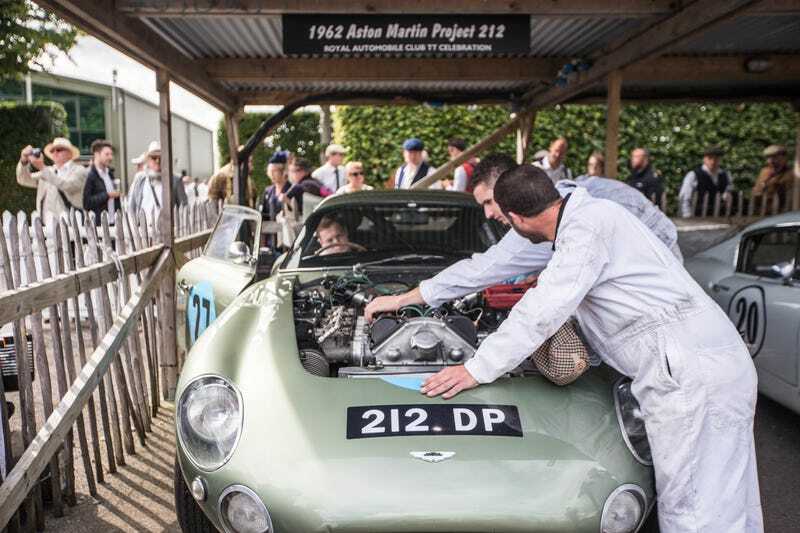 The Goodwood Revival, counterpart to the Goodwood Festival of Speed, is all about vintage cars, as its name describes. Held over the course of three days at the Goodwood Circuit instead of on Charles Gordon-Lennox, the 11th Duke of Richmond’s driveway, the Revival brings the iconic race cars of the 1920s through the 1960s together and back to life. They aren’t just sitting there all pretty, either. They are going toe-to-toe on the racetrack. It’s like being yanked back in time. Here’s some of the stuff I saw. The Paddock is where you can get up close and personal with all of your favorite bedroom poster race cars throughout the given decades. I may or may not have a slight favoritism towards the Ford GT40s. I’ve been to other car meets and Cars & Coffee events where someone rolls up in a replica GT40. That’s still cool and all—I love how much attention to detail is paid to those replicas—but when you see nearly a dozen of the real ones lined up in the early morning sun, your brain can’t help but stall just a little bit. I was told this was completely original and numbers-matching. Anyone want to take a guess as to how much it’s worth? No matter where you find yourself at the Revival, the screams, howls and snarls of vintage engines will inevitably find you. At the fish and chips stand. In the parking lot. In line for the bathroom. At the stall of the man selling tweed. You will always, always hear what’s throwing itself around the circuit. A part of me was afraid for the cars. I had but a vague inkling of what they were all worth, but I knew enough to understand that most probably cost more than any amount of money you or I would see in our lifetimes. You take a car that’s that rare and worth that much and you... race it on a circuit? Against other equally expensive and rare cars? Seems a bit crazy to me. But then, of course, that’s what they’re meant for. Roughly all the runs on Saturday were qualifying rounds. It only threatened to rain later on in the afternoon. The clouds barely lifted that day. I spoke to one driver who prayed for rain—his car was slightly underpowered compared to the others and he claimed that rain was the great equalizer. Easily the most exciting event on Sunday was the Royal Automobile Club Tourist Trophy Celebration race. GT cars from 1960 to 1964. Two-driver, closed cockpit. And at about an hour long, it’s the longest race of the Revival. It started to rain. But because we were in England, all the spectators opened up their umbrellas of various colors and sizes and kept right on watching. Of course, no tour of the Goodwood Revival would be complete without a jaunt through the parking lot, or the Revival Car Show. You’ll find vintage cars of all eras here, parked on the muddy grass, their fenders filthy from the journey. A large majority of the cars were British, but there were still a handful of German, American and Italian examples. I didn’t see any Japanese cars. And it just went on and on. You have to tackle this thing systematically, row-by-row, or else you’ll miss something. And it made me so happy, seeing these cars parked there in the mud, water lovingly beading on them from the light drizzle. People actually drove these cars here! They drove them onto the grass and they were getting rained on! They were getting used!